Late on Monday afternoon, Sen. Lindsey O. Graham (R-S.C.), offered, by way of Twitter, a report on his Columbus Day round with President Trump: "President Trump shot a 73 in windy and wet conditions!" Some golfers howled, but on Tuesday afternoon, in a 33-minute phone interview with GOLF.com, Graham repeated that Trump had indeed shot 73. Or 74, tops. Asked if the president took any mulligans, Graham said, "Not one mulligan. Not one." Graham said the president made one birdie, one or two bogeys, and pars on all the other holes. The setting was Trump National Golf Club Washington, a private club with two layouts in Sterling, Va., 30 miles from the White House. Graham wasn't sure which of the two courses they played but his description of the round indicated that they played the par-72 Championship course, which earlier this year was the site of the Senior PGA Championship. Graham said they played from the blue tees and that it measured "about 6,800 yards." That would make the course roughly the same length as the one on which Bernhard Langer won the Senior PGA in late May, an event in which over four rounds nearly half of the field's recorded scores were 74 or higher. Graham, a lifelong golfer, cited Sam Snead's recipe to shooting good scores in explaining Trump's round: "Sam Snead would say, 'I don't get no sixes.' I can say without hesitation, Donald Trump did not come close to making a double bogey all day." Graham said Trump trounced him in their $10 Nassau. They played in a twosome, sharing a cart. The club's general manager, Kevin Morris, a former club pro, walked with them but did not play, although he did offer tips to Graham. Graham and Trump drove to the course together in a 30-car presidential motorcade, and on the course they played out of one cart, with Trump at the wheel. Asked about how they handled conceded putts, Graham said, "He's better at receiving than giving." In addition to having the ring of truth to it, Graham's comment about their gimme putts is funny. Still, the senator's claimed score for Trump is patently unbelievable to many golfers. A score of 84 would seem plausible. Trump is a good golfer. But a 73, from a 71-year-old who plays often for a president but infrequently for a low-handicap golfer? Unlikely, to say the least. As a rough comparison, the Hall of Fame golfer Hale Irwin, who turned 72 in June, has a scoring average of just over 73 in the seven Champions tour events he has played this year, with an average drive of just under 250 yards. Graham said Trump's average drive was around 250 yards. In the aftermath of his tweet, some thought Graham, who has often feuded with the president, might be attempting parody-by-Twitter, mocking the score of 38 once claimed by Kim Jong-Il, father of North Korea's current Brilliant Comrade, on a full-length par-72 course. But Graham made it clear that he was not working in satire. "On the front nine, he shot even par," Graham said. "I shot a 41, which is good for me. He hit almost every fairway. He had seven Hogans, driving it on the fairway, hitting it on the green. On the back nine, he was one over, two over at the most. He had one birdie on the back, and just really hit the ball well. On the front, he made four 10- to 12-footers for par. That's what got him to shoot even-par on the front. He missed a four-foot birdie putt. He could easily have been one under." Describing their wager, Graham said, "He gave me two shots a side. I'll never let that happen again. I'm about a 12 [handicap], on a good day. He's two to four. I'm gonna get four shots a side next time. I'm gonna negotiate better." Regarding Trump's swing, Graham said, "What impressed me about the president is that he has a nice, compact swing, and he can get it up-and-down from jail. He's very accurate with his drives and hits his irons consistently. The course was playing long. His go-to tee shot is a down-the-middle line drive with a little draw. … On a 430-yard par-4, he hit a really good drive, a three-wood, or a hybrid, and made a par. He hit the ball on the screws almost every time. He sets up behind the ball. He has an athletic swing. He goes down and gets it." Graham repeatedly described Trump as an ideal host. "I ran out of golf balls," he said. "He started giving me golf balls. He's a gracious host. They didn't have the presidential seal. You know, they make TaylorMade golf balls in South Carolina. I'm going to have some made for him. They make them 10 miles from where I live." Graham said it was not until the second half of the round that they talked about their professional lives and the nation's business. "We talked about serious things on the back nine," he said. "North Korea. Iran. Immigration. But the first nine was all about golf. Donald Trump on the golf course is a very charming, gracious man. Very funny. Very competitive, but gracious. When you host somebody, you want them to have a good time. We would play a hole, he would talk about the hole, how they took trees down. He had a lot of pride in the course. 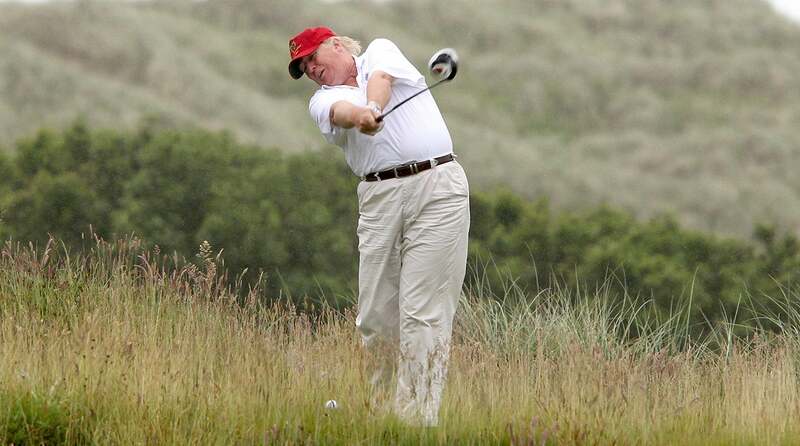 It's something, to play a golf course with the president of the United States on a course he owns. He's got that big, giant flag there—it's pretty stunning." The first: "Really enjoyed a round of golf with President @realDonaldTrump today. President Trump shot a 73 in windy and wet conditions!" The second: "How bad did he beat me? I did better in the presidential race than today on the golf course! Great fun. Great host." That was on Monday afternoon. By Tuesday morning, golfers and commentators across the political spectrum were weighing in on the claimed score. Richard Haass, the president of the Council of Foreign Relations and a serious golfer who attended the Presidents Cup last month as a spectator, addressed Graham in a tweet: "Lindsey: how many mulligans? how large was the circle of friendship on putts? what tees? strains credulity to believe this was a real 73." David Frum, a former speechwriter for George W. Bush, asked what many were asking in a three-word tweet: "Did he cheat?" Graham is sticking by his claim of 73 for the president—or 74. At the end of the round, he owed the president $30, but had only $5 with him, which the president accepted. "I did it," Graham said. "I did it on my own."